While we were working on the Gouda, she let the focaccia dough rise a bit, and sprinkled on some rosemary and a few other spices (I was so busy with the cheese... salt? pepper? that might have been it). 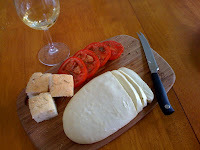 We sliced up an organic Roma tomato, and opened a bottle of Curtis Roussanne that I had been saving for an afternoon such as this, and... voilà! Deliciousnessosity! mmm, I might make myself stupid now, but...I would really like to make this mozzarella and I have already bought all these ingredients. I just don´t now what to do with those. Can you please help me? thank you very much! I´ll have to try today, because it´s Friday...!! !